PerryGolf is proud to again partner with Azamara Club Cruises for an exceptional golf and sightseeing voyage around the Iberian Peninsula on board the outstanding Azamara Journey. 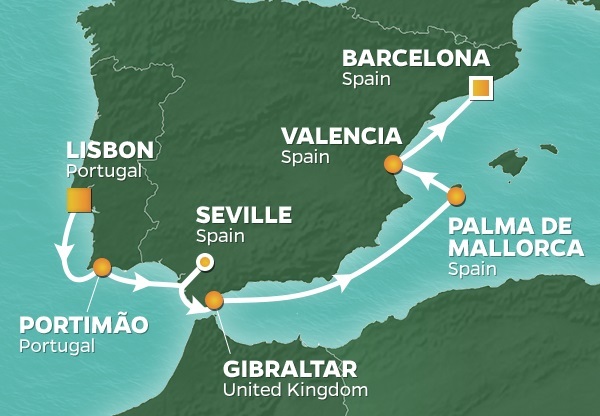 This voyage will also feature a special and scenic daylight sailing of the Guadalete River to and from the historic city of Seville. Our itinerary begins in Lisbon, Portugal and concludes in the vibrant Spanish city of Barcelona. The golf lineup includes the highly regarded ... Read More. Faldo Amendoeira Course in Portugal’s Algarve Region; The Jose Maria Olazabal designed Royal Seville Golf Club; Valderrama, consistently rated #1 in continental Europe; Mallorca’s Son Gual and Barcelona’s renowned El Prat completing the five round program. A three night precruise option is offered including play at the highly rated Oitavos Dunes and Penha Longa. PerryGolf’s cruise staff will be on board and ashore to oversee all aspects of your golf experience from daily pairings to the handling of your golf clubs. Many guests are golfing couples along with a number who are golfers travelling with a non-golfing spouse who are exceptionally well catered to as well. In addition to the fabulous on board facilities, which all will enjoy during our “sea time” as we traverse the Iberian Peninsula, a wide selection of Azamara Shore Excursions® are offered in each port. On board, our guests are absolutely spoiled. The 690-passenger (410 crew) Journey is large enough to provide every comfort and amenity; outstanding restaurants and bars, an exceptional full service spa, an excellent variety of evening entertainment. Yet she is small enough to provide an intimate, clubhouse style experience while comfortably navigating smaller harbours. In addition to “normal” cruise features, all soft drinks, specialty coffees, boutique daily wines, and a choice of select standard beers and cocktails are inclusive within the cruise fare, as are all gratuities. Forty-four suites are available on Journey attended by English-style butler service. If you are inclined to indulge, we recommend you make your arrangements without delay. Embark Azamara Journey 1:00PM. All aboard 3:30PM. Welcome Cocktails & Briefing this evening. Meet your fellow participants. Portimão is located in the District of Faro in the Algarve Region of Portugal, and is the host venue for many prestigious sailing events. The Lisbon to Dakar Rally passes through, and there is also surfing and kitesurfing. This is a great place for seafood restaurants with grilled sardines being the specialty. GOLF: Faldo Amendoeira Course, designed by Sir Nick Faldo, opened for play in 2008. In a modern twist of a traditional recipe, cacti and wild herbs replace the role of Sunningdale’s heather, and spartan holm oaks and ancient olive trees take the place of a lush English woodland, and desert scrub bunkers of crushed limestone replace Berkshire’s sandy tracts in a golf course that revels in the classic principles of strategic play. It also enjoys great views, in particular on the back nine. Enjoy a scenic morning navigation of the Guadalete River on board Azamara Journey, an opportunity denied to larger ships. Our early afternoon arrival allows a half day and overnight in this historic Spanish city. Seville - the passionate nature of Sevillanos is evident in their devotion to bullfighting, flamenco, and fiesta. Food too, it appears, as Seville is credited with the invention of tapas. Join in with the locals as they graze from bar to bar, making an entire meal out of the experience. The city also has a rich history evident in its old quarters and landmarks. The great cathedral is immense, lavishly ornamented with paintings and sculptures, and copious quantities of gold. The Alcazar, the main palace, is exquisitely decorated in Moorish style, with themed gardens laid out in terraces. Enjoy Seville on your own or via Azamara Shore Excursions®. Enjoy a second day in Seville. GOLF: Royal Seville Golf Club was designed by Jose Maria Olazabal. Its balanced and well manicured layout is set through trees and lakes and hosted the 2004 World Cup of Golf, the 2008 & 2010 Spanish Open on the European Tour, and it is ranked within the top five in Spain by Golf Digest. Following golf we make a scenic navigation of the Guadalete River as we head back out to sea for our sailing to Gibraltar. The Rock of Gibraltar is a sight to behold rising nearly 1,400 feet out of nowhere located in a strategic position at the southern end of the Iberian Peninsula. It overlooks the Straits of Gibraltar and is linked to Spain by a narrow isthmus. Most of the upper Rock, starting just above the town, is a nature reserve with spectacular views accessible by cable car. Gibraltar is imposing but small. It measures less than six square kilometres and is inhabited by around 30,000 people made up of Gibraltarians, British, Moroccans, Indians and Spanish. There is a colony of the famous, camera-hogging Barbary apes who run free in a semi-wild state. Gibraltar is a British self-governing colony and a member of the European Union by virtue of Britain's membership. Enjoy Gibraltar on your own or or via Azamara Shore Excursions®. A day at sea. No golf. No sightseeing. No worries. Here’s your chance to reset with the help of four restaurants plus cafes and lounges, a pool, sun decks, a spa, fitness center, jogging track, hair salon, shops, casino and cabaret lounge. Azamara’s clubhouse style ambience provides a hybrid of luxury and big-ship cruising with every amenity presented in an intimate setting with superb service. Note that the best cocktails are found along with the best views on Deck 10 in the Living Room where you can admire the Murano glass and gaze out the floor-to-ceiling windows. The original city of Palma dates back to Roman times; modern day residents of the old quarter are still digging up artifacts in their gardens. Balanced on a seawall above the marina is the amazing gothic Cathedral, icon of the city, with some of the world’s largest stained glass windows. Also high on the artistic scale is the Museum of Contemporary Spanish Art featuring works by masters including Picasso, Miró, Gris, and Dali. Mother Nature’s aesthetic achievements can be found in the Caves of Drach—mystical caverns where the play of shadow and light on the rock formations stimulates the imagination. GOLF: Son Gual has been lauded since it opened in 2007. The Thomas Himmel designed layout is considered the finest of the Balearic islands and is one of the most talked about venues in southern Europe, with the European Golf & Travel Media Association naming it as 'The Discovery of 2010'. Son Gual enjoys a lovely location, peppered with mature olive trees and wild flowers, with its design and conditioning being of the very highest standard. Enjoy a three (3) night pre-cruise stay in beautiful Lisbon at the Oitavos Dunes Resort including golf at two of the area's finest golf courses – – Oitavos Dunes and Penha Longa. The Oceânico Faldo Course at Amendoeira, designed by Sir Nick Faldo, opened for play in 2008. In a modern twist of a traditional recipe, cacti and wild herbs replace the role of Sunningdale’s heather, and spartan holm oaks and ancient olive trees take the place of a lush English woodland, and desert scrub bunkers of crushed limestone replace Berkshire’s sandy tracts in a golf course that revels in the classic principles of strategic play. It also enjoys great views, in particular on the back nine. Royal Seville Golf Clubwas designed by Jose Maria Olazabal. Its balanced and well manicured layout is set through trees and lakes and hosted the 2004 World Cup of Golf, the 2008 & 2010 Spanish Open on the European Tour, and it is ranked within the top five in Spain by Golf Digest. Valderrama is a perennial World 100 layout consistently been rated among the five best in Continental Europe. “The Augusta of Europe” is a private club originally designed in 1974 by Robert Trent Jones on a hill above the old Andalucian village of Sotogrande. He was recalled in 1985 for a remake that has subsequently hosted a plethora of championships including the Volvo Masters and the 1997 Ryder Cup remembered for Europe’s late, great and charismatic captain Severiano Ballesteros. Son Gual has been lauded since it opened in 2007. The Thomas Himmel designed layout is considered the finest of the Balearic islands and is one of the most talked about venues in southern Europe, with the European Golf & Travel Media Association naming it as 'The Discovery of 2010'. Son Gual enjoys a lovely location, peppered with mature olive trees and wild flowers, with its design and conditioning being of the very highest standard. Oitavos Dunes Located on the famous Estoril coast, 25 kilometres from Lisbon. The Arthur Hills designed course is set among pine woods and reforested dunes, in an area of great natural beauty. Surrounded by the Sintra mountains to the North and by the Atlantic Ocean to the South and West. Since is opening in 2001 it has been a regular host for professional tournaments, including serving as host for the European PGA Tour’s Portugese Open. A world renowned layout, often ranked. Penha LongaDesigned by Robert Trent Jones Jr., this layout opened in 1992. The championship course measures more than 7,000 yards and is particularly attractive due to the conditioning and breathtaking views of the ocean with Estoril and Cascais in the foreground, and also of the Sintra Hills. Typically ranked among the top 50 courses in Europe, it can challenge the recreational golfer of the profession. It was the host site for the 1994 & 1995 Portuguese Open Championships. The Faldo Amendoeira at Amendoeira, designed by Sir Nick Faldo, opened for play in 2008. In a modern twist of a traditional recipe, cacti and wild herbs replace the role of Sunningdale’s heather, and spartan holm oaks and ancient olive trees take the place of a lush English woodland, and desert scrub bunkers of crushed limestone replace Berkshire’s sandy tracts in a golf course that revels in the classic principles of strategic play. It also enjoys great views, in particular on the back nine. Royal Seville Golf Club was designed by Jose Maria Olazabal. Its balanced and well manicured layout is set through trees and lakes and hosted the 2004 World Cup of Golf, the 2008 & 2010 Spanish Open on the European Tour, and it is ranked within the top five in Spain by Golf Digest. Oitavos Dunes is located on the most westerly tip of Europe and mixes wonderous views of the Atlantic Ocean with the stunning backdrop of the Sintra Mountains. Oitavos was designed by the renowned Arthur Hills and is one of only two European Courses that bear his name. The course is a recent addition to the area in golfing terms and was inaugurated in 2001 while now ranking in the world’s top 100 courses. Oitavos Dunes is a par 71 course that measure 6,300m from the competition tees. The course is a lovely mixture of woodland and links-type holes that make the most of the existing landscape. Designed by Robert Trent Jones Jr., this layout opened in 1992. The championship course measures more than 7,000 yards and is particularly attractive due to the conditioning and breathtaking views of the ocean with Estoril and Cascais in the foreground, and also of the Sintra Hills. Typically ranked among the top 50 courses in Europe, it can challenge the recreational golfer of the profession. It was the host site for the 1994 & 1995 Portuguese Open Championships. Green fees and starting times for number of rounds as indicated including shared use of electric golf cart.